Apple has shown continued interest in using the forward facing camera on devices like the iPhone to unlock the display and customize its layout based on detecting the identity of the person using it. Evidence of Apple's interest in having devices identify users with facial recognition technology has repeatedly cropped up. In early 2010, before the iPad was announced, The Wall Street Journal revealed that an early prototype of Apple's touchscreen tablet would use a forward-facing camera to recognize users' faces, allowing it to be one device easily shared by the entire family. 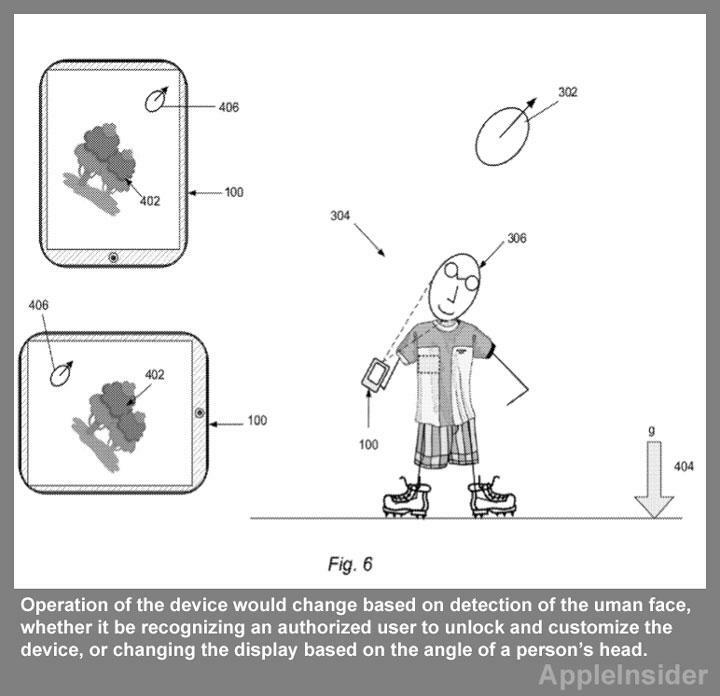 This week, AppleInsider found another example of Apple's desire to have iOS devices recognize users in a new patent application entitled "Electronic Device Operation Adjustment Based on Face Detection." It describes using a forward facing camera on a device to recognize individual users and also track the orientation of their face with respect to the device. The application describes a system that could scan and detect a specific user's face, and then unlock the device after the person has been recognized. If the user cannot be identified by the system, they would then be presented with the option of entering a security code to unlock the iPhone or iPad. But Apple's application goes well beyond simply unlocking the device. By recognizing a specific user, the system could customize its layout or other settings based on the pre-set preferences of that authorized user. "If the detected human face is recognized... an operation of the (device) can be modified based upon the recognized human face," the application reads. "The modification can include executing a pre-defined set of operations such as opening email, opening text messages, and so forth." A similar concept was detailed in another patent application discovered by AppleInsider in December of 2011. That filing described iPhones and iPads that could automatically customize applications, settings and features to a user's personal preferences once they pick up the device. The latest application revealed this week also presents a new potential use for the forward facing camera on iOS devices, describing a system that would automatically adjust the images on screen based on the orientation of a user's face. "The facial data can be used to determine an orientation of the human face relative to the orientation of the presented visual content," the filing reads. "In other words, the electronic device can determine if the orientation of the presented visual content, is substantially the same, or different, than the orientation of the human face." In this way, the content on the screen could readjust itself so that the user can more clearly see it at the proper angle, without any distortion. Facial recognition technology could also be used to automatically lock a device and put it into sleep mode. If a human face is not detected by the system over a set period of time, the system would presume that it is not in use, and it would automatically lock the screen. The application, made public this week, was first filed with the U.S. Patent and Trademark Office in September of 2010. It is credited to John E. Arthur.